Gorgeous opalescent toning in stunning rainbow hues! 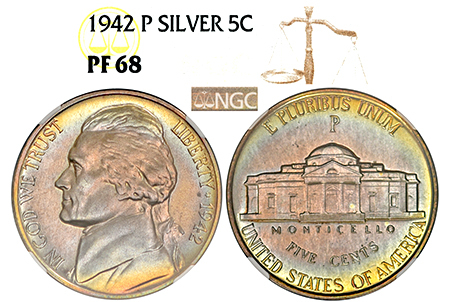 I rarely find beautiful toning such as this on a Silver War Nickel! Layers of lemon yellow, sea-foam green, lavender, sky-blue, and petal pink smother the obverse and reverse. Near-perfect surfaces are lustrous with no haze, spots, or visible hairlines. This is one of the highest grades to find in Proof condition with just 22 graded and only 5 graded higher! AND you get the SPECTACULAR toning to boot!